Sometimes a photograph needs more "zing", more "pop". Aesthetic decisions are difficult to quantify and harder to automate, but here are some tools aimed at large images derived from raw camera files. The full-size result massively shrunk. A crop from near the centre of the result. 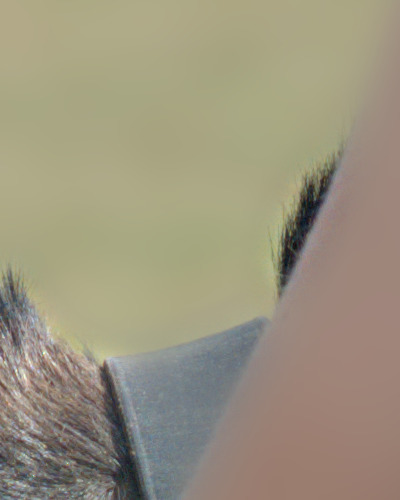 This shows part of the woman's arm, donkey fur, leather harness and distant out-of-focus grass. 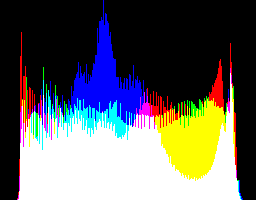 A histogram of the full result. The script for doing this is not (yet) published, so this cookbook starts with an image that already has a "correct" gamma. Pixel values are present from zero to one, so auto-level will do nothing. 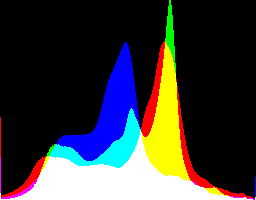 But the image has very few dark or light pixels, also evidenced from the low standard deviation (0.095) and the histogram is mostly scrunched up in the middle. 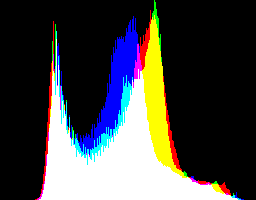 The histogram shows that some pixels have clipped, at both ends. The GMS image above has a low standard deviation (low contrast), and we can increase it to any value we want. The script sigSetSd.bat iterates to find a solution, so it isn't fast. The script can be run on a small version of the image with little loss of accuracy. Use this as the source for following operations. Sigmoidal-contrast of 7.09 is a fairly heavy increase. The steepest increase is at tone=37%. The SD has increased to the required value. The mean has also increased, towards 0.5. Where this increases contrast, it also increases saturation. If we want to avoid this, we can perform sigmoidal-contrast on just the lightness. Equalising the histogram can be useful to see detail in highlights and shadows. The result has a mean of about 0.5, and a standard-deviation of about 0.2889 (which is usually a big increase, for photographs). By itself, the result is usually unattractive. 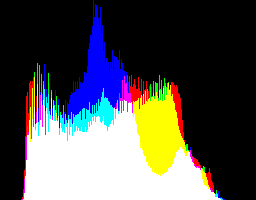 As with SSD, where the contrast is increased, so is the saturation. The simple equalisation has clipped both ends. We can reduce or eliminate this. Blending an equalisation with the source is more attractive. A 50% blend is often good. 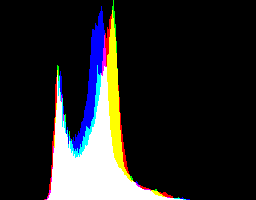 An alternative to blending is the limit the contrast-shift caused by the equalisation, using the script eqLimit.bat from my page Process modules: equalisation. Here, I limit the contrast-shift to (mean + 1*SD). Blending 50% of the equalisation with the source limits the shift of all the pixels equally. By contrast, eqLimit.bat limits the shift to a certain maximum, while increasing the shift of other pixels. 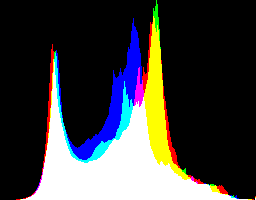 So eqLimit.bat results in a wider spreading of the overall histogram, while retaining the peaks. The result is less flat, more lively, than the 50% blend of equalisation and source. The script exHvyBlr.bat is like unsharp masking, but with much heavier blur. Highlights have clipped badly. Local contrast has increased. 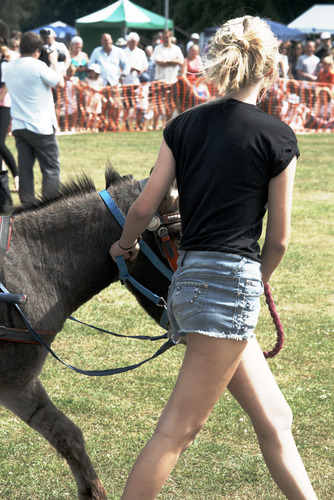 Unfortunately, this has made the background people more distracting. The script lbdMask.bat shows where there is detail. The mask is white where there is detail and black where there isn't. This approximates to what is in focus, but skin tone that has little detail shows as black.  We can use the LBD mask to sharpen the sharp objects and further blur the unsharp objects, by composing the EHB sharp version over a blurred version. Distant grass and people are blurred. 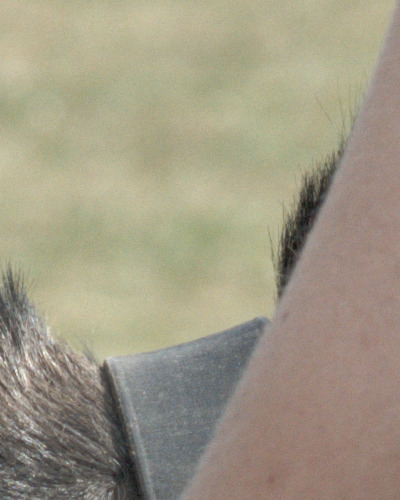 Foreground skin is also blurred, removing texture but also removing the boundary between skin and unfocused grass (top-right of crop). Most donkey fur is sharpened, but individual strands top-right are blurred away. We could reduce these side-effects by enlarging the white areas of the mask with morphology dilate, or another method. The effect is similar to both IM operations "-adaptive-sharpen" and "adaptive-blur". My method is slower, but I have total control over the "adaptive" part. has greater differential focus: sharp fur, hair and near grass are sharper; distant people and grass are blurrier. has greater local contrast, especially noticable in the hair and foreground grass. See the pages Adaptive auto level and gamma and [Adaptive] Contrast-limited equalisation. We don't need to keep all those huge tiff files, so delete them. This finds the contrast parameter of the "sigmoidal-contrast" operation, and the "+" or "-" sign, that gives a required standard deviation (SD). It doesn't try to maximise the SD, because increasing contrast always increases SD, until we have a black-and-white image. A required input to this script is the mid-point of the sigmoid. (This is the steepest part of a "-" curve, or the shallowest part of a "+" curve.) In practice, setting the mid-point to the mean of the image often works well, so this is an input option. The default goal SD is 0.166667. 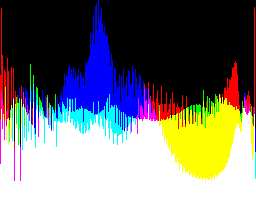 Initial guesses for the contrast are 0.0000001 and 30. 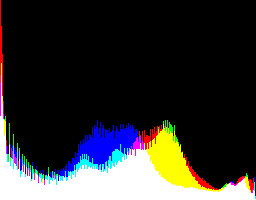 From two guesses, the script finds the SD that results from each contrast setting. Then it starts looping. In each loop, it finds the geometric mean of the two guessed contrasts, and the SD from that contrast. Now we have calculated three SDs. The required SD is between either the first two or the last two. We discard the worst result, leaving us two guesses for the contrast. Continue looping until we have converged: two contrasts are equal, or two SDs are equal, within the desired precision. rem For image %1, finds the +/-sigmoidal-contrast that makes the standard deviation a given goal. rem %2 is required mid-point for sigmoidal-contrast, as percentage, eg "50". rem   Or "mean" to use the mean of the image. @rem   sssPRECISION default "-precision 6"
@rem   sssDIRECTION "incOnly", "decOnly" or "both". @rem     For "incOnly", has goal of only increasing SD. If current SD >= goal, does nothing (and returns sssALREADY_CLOSE=1). @rem     For "decOnly", has goal of only decreasing SD. If current SD <= goal, does nothing (and returns sssALREADY_CLOSE=1). @rem     For "both", has goal of increasing or decreasing SD as required. @rem    sssFALSE_RESULT = 0 (okay) or 1 (algorithm failed). @rem with few mid-tones to be shifted by "+sigmoidal-contrast". rem Are we already close? 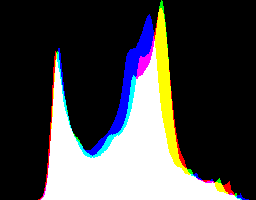 rem make contrast-limited histogram-equalised (with iterative redistribution) version. @rem   %2 is limiting factor SD_FACT, so limit = mean + SD_FACT * standard_deviation. @rem   %3 is percentage lift for shadows. Maximum < 100. Default 0, no lift. @rem   %4 is percentage drop for highlights. Maximum < 100. Default 0, no drop. @rem   %5 is output file, or null: for no output. 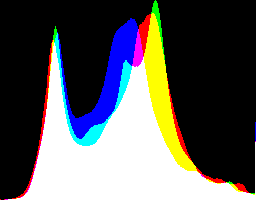 @rem   eqlDEBUG if 1, also creates curve histograms. @rem   eqlDIFF_LIMIT iteration stops when the count redistributed is less than this percentage. @rem     Set to a value >= 100 to prevent iteration. @rem   eqlSUPPRESS_OUT if 1, suppresses output. rem If max(eql_gch) > histcap + epsilon, repeat. rem In following, "-blur" should really be "decomb". rem Extrapolate away from heavy blur. Increases local contrast. rem A bit like tone-mapping, HDR, High Dynamic Range. @rem %2 is resize amount (inverse of blur radius) as percentage of image size. @rem   Large amounts (25-100) give unsharp mask. @rem %3 is extrapolation as percentage. @rem   0 is blur; 100 is no effect (unchanged image), 150 is subtle, 15000 is massive. @rem %4, if given, is output filename. 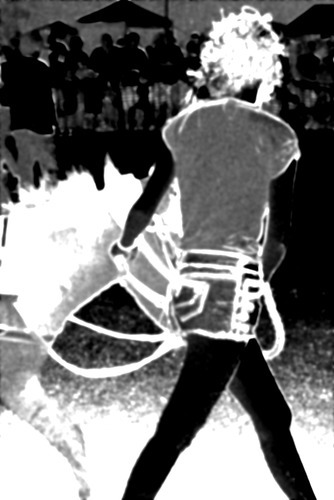 rem Makes a mask from LBD, difference from light blur resulting in monochrome RMS. rem White or light where there is detail; black or dark where there isn't. rem %2 is blur sigma in pixels. Source file for this web page is zingph.h1. To re-create this web page, execute "procH1 zingph".